In the Palace in Xel-Ha, Quintana Roo, Mexico. Leaving the Cancun airport in our rented car, I marvel of the changes I see. Across from the giant water park, the real Xel-Ha is a stunning Mayan ruin you can visit. I have been visiting the peninsula for over two decades, and I see changes every time I come. The old road, once surrounded by jungle, is a highway now. As much as I miss it being so narrow that two cars would barely fit through it, the ease of travel is a benefit I enjoy. Soon after my husband starts driving, I notice signs for Xel-Ha, the water park. Though we are not heading for it, I think about the name. It derives from the Yukatek Maya, combining the words Xel – spring, and Ha – water. The ancient Maya used the location to build a port-city across from the lagoon, structures of which still stand centuries later. The lagoon and inlet that gave the place its name is now a water park, by the name of Xel-Ha Park. Opened in the past ten years, the park on the water is teeming with tourists. Although we have visited the peninsula many times, we still haven’t been there. That is not to say that we have not visited Xel-Ha lagoon. Before it became a huge tourist trap, the lagoon was a local water park, open for snorkeling. The entrance was a small palapa hut, where we paid an entrance fee of a few pesos and promised not to use sunscreen since it hurts the ecosystem in the lagoon. Before entering the actual park-lagoon, we showered, to remove any trace of sunscreen. The beach was small, the water cold and crystal-clear. We snorkeled for a while, enjoying the colorful fish and sea creatures. Of course, we got burned but considered it a small price to pay for keeping the lagoon clear. I remember sharing the place with very few local families and visitors. Since the place is a world-class resort and park, we try to avoid it. We prefer to keep the old image of it in our memory. Rushing towards it, cars and buses drive by the small sign for Xel-Ha Ruins without a second glance. Trying to deal with traffic, we almost miss it, as well. Only the fact that we know where it is makes us look for it. The old, dirt parking lot is empty, we are the only visitors here. It is so pleasant to feel the breeze, listen to the birds, and even take the time to chat with the caretakers. Crystal-clear water in the cenote at Xel-Ha. Our old friend is not there any longer. He used to offer to take us to the water park through a trail from the ruins, only known to locals. We never took him up on the offer, since in those days the entrance fee was low enough not to matter. We would go now, but no one offers to guide us. We pay the modest fee for the ruins, then take off on the path. Being here brings back memories of my very first time in Yucatan, over twenty years ago. The ruins are still standing as they did since they were abandoned a few thousand years ago. However, more of them are cleared off, and entrances into the old structures are off-limit now. The main trail forks as soon as we enter. This time we take the one to the left, leading to the Palace Group. Shaded by trees, the group consists of two major structures, the Market, and the Palace. Both date from the Late Post-Classic Era of the Mayan civilization, about 1200-1550 AD. We enjoy exploring them, especially since it is so quiet, so peaceful in there. Our only companions are the birds and an iguana laying on the rocks of the ruined structure. As we leave these structures and follow the path, we come to the more impressive Pyramid of the Birds. As pyramids go on the peninsula, it is a small one. What it lacks in size it makes up in the beauty of its well-preserved murals. 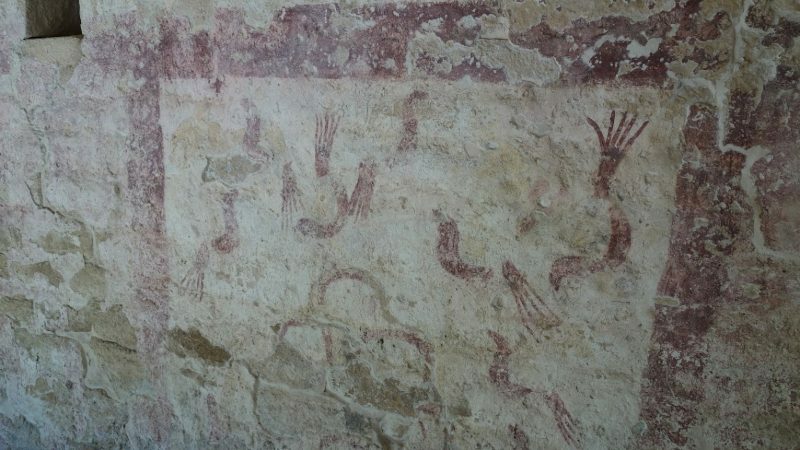 Now under a cover to preserve it, this mural of birds gave the pyramid its name. The composition is still striking after all this time, as it depicts two different kinds of birds. Two red frames enclose the pictures of red birds, with long tails, and some that seem to be yellow parrots with shorter tails. They look like they are flying everywhere. The frames are separated by a column with a glyph on it. I know from my readings that the glyph stands for the Mayan word, “Ahau”. It means Lord or ruler. It is also the name of one of the days in the Mayan calendar. Much of the mural is ruined, but thanks to the palapa cover, most of it is still clearly discernible. I am in awe thinking of the age of this paint, still beautiful if faded. Ancient Mayan artists have painted it sometime between 300 and 600 AD., a date that corresponds to the Early Classic period of the Mayan Civilization. The pyramid of the birds is the only structure this old. The rest of the preserved site is newer. The reason this particular structure it is so well preserved is that it had been encased in a newer building for centuries. 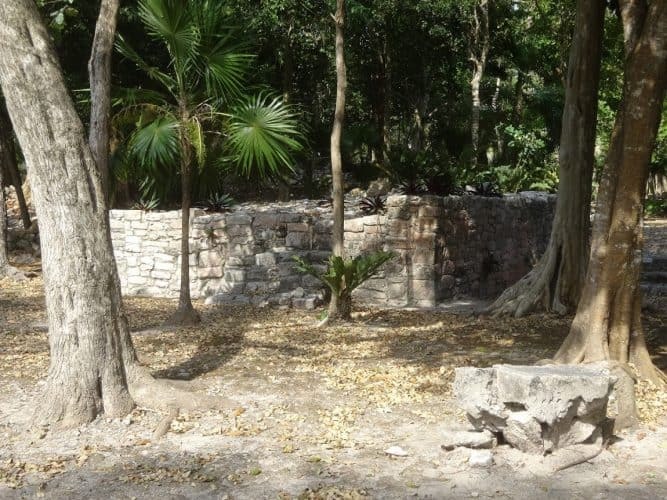 This was a common practice among the Ancient Maya in a land where building material was scarce. As the newer structure started to fall apart, this much older one was revealed. Ancient drawings were done by Mayans thousands of years ago on the walls. I stand on the pyramid, in front of the mural of the birds. I am just about on the busy highway, with cars and tour buses zooming a few feet from me. We are only separated from it by a wire fence and some trees. Yet no one looks up, they are all in a rush to get to the next big destination, the busy park, the huge resort. “Slow down, come take a look at this!” I want to yell. In the same time, I am glad no one stops. It keeps the place serene, quiet, pleasant, a good place for birds and wildlife. After spending enough time at the small pyramid, we turn around and walk back towards the Mercado. 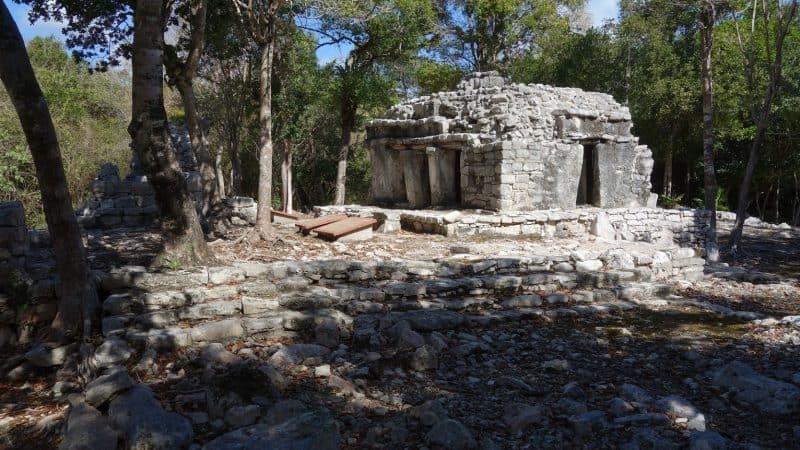 From there, we choose to follow the old Mayan road, called sacbe, to the next structures. A sacbe is an ancient Mayan road, it roughly translates into “white road”. The ancient Maya made these roads from limestone, which gave them the distinctive white color. This particular sacbe continues to the much bigger site of Coba, inland. On the other side, it also connects the site with the coast. Following my family, I continue to walk towards the group of the House of the Jaguar. This is the very first Mayan structure that I have ever seen twenty years ago. I still remember my original excitement and awe, standing in front of the murals inside. At the time, I was able to enter the structure and walk through it. Now it is closed to the public, but most of the images are still visible from the outside. The picture of the jaguar still stands on the outer wall of the building. It shows off the very distinctive Mayan blue, the dominant color of the building believed to be a temple. The red handprints on the panels of the doorway are still clearly visible as well. 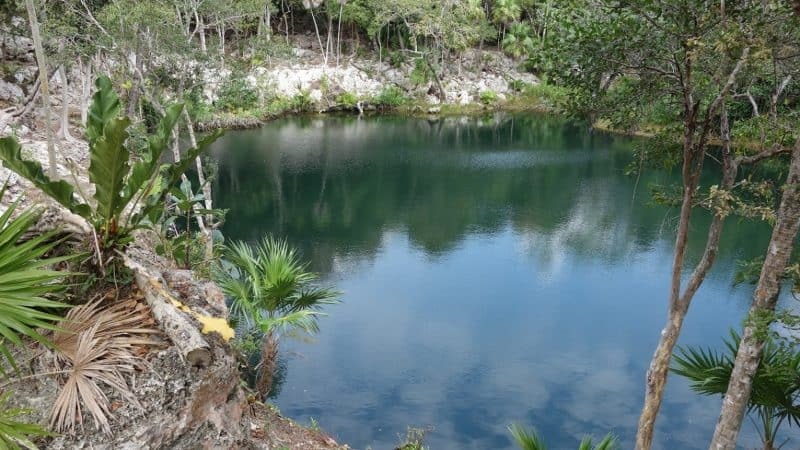 As I walk through the ruins, I stop at the cenote. Surrounded by tall trees, with crystal clear, deep blue water, it’s one of my favorite spots. I walk to the edge of the water and join my daughter, who is sitting there, watching the fish in the water and a dragonfly fluttering above it. top during our adventures through the peninsula. 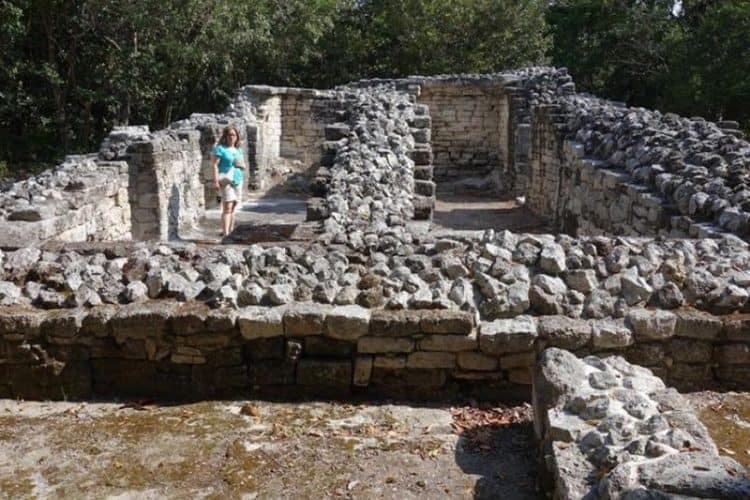 Xel-Ha Ruins are right on Highway 307 between Cancun and Tulum. Since the place is not advertised, it is easy to miss. Driving from Cancun, start looking for it as soon as you see the big signs for Xel-Ha Park. The dirt parking lot with a small sign for “Zona Arqueologica Xelha” is on the right. The entrance fee is 70 pesos for adults, children under 10 are free. The only amenities are the restrooms in the building where the ticket counter is. Make sure you have good walking/hiking shoes, and water. Wear a hat and sunscreen since the sun is very intense. Don’t forget your water. Enjoy your visit. 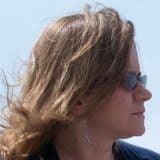 Emese Fromm is a writer/translator living in Phoenix, Arizona, who loves to travel and explore new places with her family.